Hours: Call for appointment. We ship mandarins. Products: Satsuma Mandarins and other as listed: blood oranges, quince, figs, Key limes, Fuyu persimmons, Bearss limes, Eureka lemons, Meyer lemons, Cara Cara oranges, pomegranates, clementines, and Oro Blanco Pommelo. Burgeson Family Farm is a small family farm on a beautiful sunny hilltop below Indian Hill Road in Newcastle. 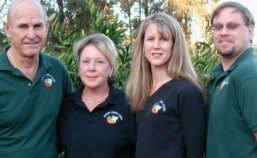 The property has excellent soil and a warm microclimate so the Burgesons often experiment with growing foods not typically grown in our area, such as unusual citrus and semitropicals. 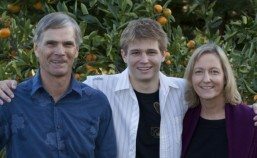 They practice sustainable farming methods in the care of their their land, and all the farm work is done by Adrian, Dayna and their son Evan. Dayna is a Registered Dietitian who spent her career promoting healthy eating with the University of California. 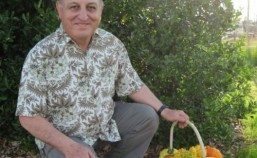 Adrian is a retired elementary school teacher who taught hundreds of children the benefits of gardening through his yearly school garden projects. Evan is now an avid gardener and cook, so the love for farming may be hereditary. Please call to arrange farm tours or to purchase products in season. 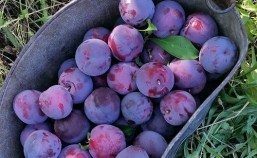 For more information, recipe ideas and more check the farm website. Products: Mandarins, limes, lemons (Meyer, Eureka, and Santa Teresa), oranges (Blood, Navel and Valencia), kumquats, grapefruit and pomegranates. Marinades, dressings, vinaigrettes and spreads produced from citrus that we grow.